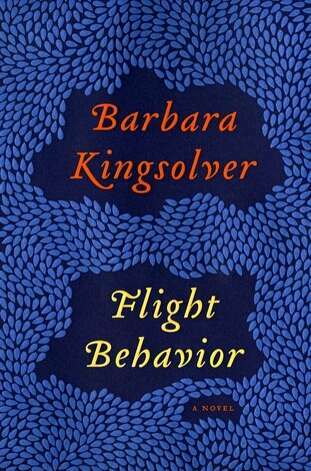 I felt so confident that I would love Barbara Kingsolver's latest novel, "Flight Behavior" (2012) that I actually bought it. New. In hardcover. I had an option at the time, because I had a gift card to the fabulous Greenlight Bookstore, to purchase two of her earlier works in paperback, but went for the shiny new book instead, because I've followed her career and she tops herself with every subsequent work she publishes. Hot damn, I thought, new Kingsolver and gift card to afford the hardback. I am one lucky Big Island Rachel. "Flight Behavior" wasn't as big a disappointment to me as reading Monique Truong's mediocre "Bitter in the Mouth" after her superlative "The Book of Salt." That let-down was a literary tragedy for me because I just loved "The Book of Salt" so very much. I will get around to reviewing it someday, I promise. What both of these books have in common is that they deal with sweeping historical events from the perspective of the rather insignificant individuals caught in the middle of them. The overall effect humanizes these big, almost unfathomable occurrences that shape countries and cultures. There's something so intimate and personal about her stories, something immediate, that both transcends and illuminates time and place in Kingsolver's novels. You never feel like you're reading "historical fiction." "Flight Behavior" attempts to do the same thing, but instead of discussing Communism in the Americas ("The Lacuna") or the de-colonization of Africa ("The Poisonwood Bible"), this book is about climate change. The every-man that walks us through the issues of the day is Dellarobia, a young mother in the Appalachias who discovers a colony of monarch butterflies on her in-laws' property. The monarchs should be at their winter home in Mexico, but have instead come here, because of climate change. A media circus swirls around the butterflies appearance, a handsome scientist moves into Dellarobia's barn to study the phenom, and she realizes that she has some tough choices to make about the unhappy life she's built for herself. This is not a bad book, by any means. I read the whole thing, after all. I really like Dellarobia and feel for her plight. She married the boy who got her pregnant in high school, and while he's a good man, she's just too quick and smart for the kind of the life he can offer her. She loves her kids, but resents the hell out of the limitations of stay-at-home mothering. And she's poor. So poor, gang. Poverty in modern America is a big theme in this book, and I sort of wish it had been the sole focus, because Kingsolver describes it so well. I loved the scene where Dellarobia and her husband have a fight in the dollar store as they attempt to put together a "real Christmas" for their children on a $50 budget. The book lingers over details like their truck on its third engine, the lack of protein in their diets, the shoddy stitching on their cheap clothes, and the free lunch forms Dellarobia gives to her son to take to school. Much like Edith Wharton does in "Ethan Frome," Kingsolver illuminates the dark reality of the American dream, where all pathways to salvation and happiness require an amount of money that is simply impossible for the protagonists to acquire without an act of evil, wanton destruction. A lot of the tension in "Flight Behavior" comes from Dellarobia's father-in-law, who wants to sell the timber rights of the butterflies' mountain to a logging company to pay off his debts so he doesn't lose his land outright. If the mountain is logged, it will effectively mean the extinction of the species, because so much of the North American population is wintering on the mountain. And worse, it will only pay the debt for a month or so, leaving the family right back where it started. It's a short term act that will have permanent repercussions. Anyone else hear the whistling of the symbolism sledgehammer as it swings down toward your head? Here's where the book falls apart for me. It's about climate change, and when I say that, I don't mean that climate change is the larger issue in which these characters' stories play out; I mean it's about climate change. There's long passages where scientists explain how climate change works, what greenhouse gases are, and why every argument that states climate change isn't happening is wrong. There's protesters and activists camping out on the butterflies' mountain. There's media personalities describing how they'll put the spin on the story to make it seem like climate change is a matter of controversy in the scientific community. And at some point, all of this tips the balance, and the book stops transcending its theme. It becomes polemic, its agenda too transparent, and I feel like I'm being preached at. It's such a shame, because I feel like certain aspects of this book really do keep that balance. The preacher of the community makes some great arguments about God wanting humans to be responsible stewards of the planet, showing that the issue of climate change isn't as clear-cut as rational, science-minded people on one side and stupid religious people on the other. The scenes about poverty show that planet-destroying habits don't come from a place of selfishness or evil, but from need and lack of affordable alternative options. Dellarobia's whole situation is symbolic of climate change: she just sort of went along with everything and made the best decisions she could, until she looked up one day and realized that she was fucked. But all of that deftness and subtlety is thrown out the window whenever people sit around a table and talk about climate change. It feels so clumsy and forced, like that part in George Orwell's "1984" that is just a passage from another book analyzing how totalitarianism works. Did he think his readers wouldn't understand it without the scholarly essay? We have just spend a hundred-odd pages with characters living in that society, I think we know what's going on. I don't love all of Kingsolver's books. I didn't even finish "Animal Dreams," one of her earlier works. But the talent and skill she's accumulated over the course of her career made me expect a little more from "Flight Behavior" than was actually delivered. It's an okay book. It's just not great. Final grade: C+. Recommended for those who like family dramas, stories about the American frontier, environmental issues, and butterflies.